Kit of parts (only, use with PCB and your relay) for the relay driver option. Professionally designed circuit with back EMF protection diode, anti-ringing cap, and indicator LED. 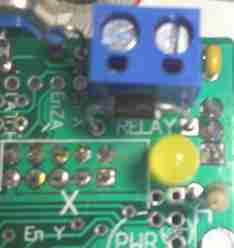 Will drive a relay capable of being activated by 5 Volts DC, and a few hundred milliamps. Uses the 5 volt power supply to drive the relay coil. DANGER! Relays can control large voltages, and high currents such as mains power to a spindle. Touching the wrong wire on your relay can KILL YOU DEAD! And accidentally shorting mains power through the relay driver will fry just about everything. We accept NO responsibility for damages to anything or anyone. TANSTAAFL!